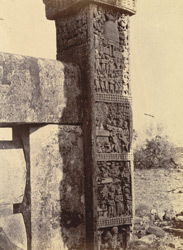 Photograph of sculptured panels on the north gateway of the Great Stupa, Sanchi, from the Archaeological Survey of India Collections taken by Joseph David Beglar in the 1870s. Sanchi is one of the most important Buddhist sites in India for the variety of monuments and quality of the sculptures. The structures date from the 3rd century BC until the 7th century AD. The main stupa consists of a large hemispherical dome built over an already existing stupa ascribed to the 3rd Century at the time of the Buddhist emperor Ashoka Maurya. Four elaborately carved gateways were added to the stupa during the 1st Century BC. The North Gateway consists of two square posts crowned with a group of four elephants and two shalabhanjika, females figures grasping the branch of a tree. These support a triple architrave with scrolled ends. The sculptured panels represent, from top to bottom, the adoration of the Stupa with the Buddha's relics by the Malla kings, the miracle at Vaishali and the return of the Buddha to Kapilavastu after his Enlightment.